The Cockerel The Duck And The Mermaids. Animated story narrated in British English. A cockerel and a duck were arguing so much over whether mermaids exist or not, that they decided to settle the matter once and for all, by searching the bottom of the sea. They dived down, first seeing colourful fish, then medium-sized fish and large fish. Then they got so deep that they were in complete darkness and couldn't see a thing. This made them terribly scared, so they returned to the surface. The cockerel was terrified and never wanted to return to the depths, but the duck encouraged him to keep trying. To calm the cockerel, this time the duck took a torch. They dived down again to the darkness, and when they started getting scared, they switched the torch on. When the darkness was lit up they saw that they were totally surrounded by mermaids. The mermaids told them that they thought the cockerel and the duck didn't like them. The previous time the mermaids had been just about to invite their visitors to a big party, but the cockerel and the duck had quickly left. The mermaids were very happy to see that they had returned, though. 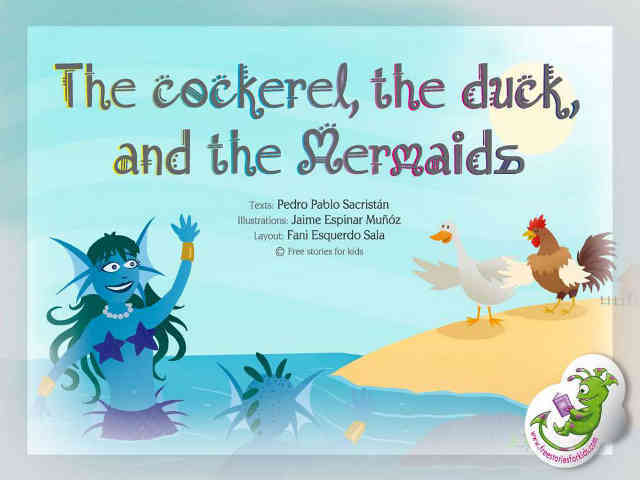 And thanks to their bravery and perseverance, the cockerel and the duck became great friends with the mermaids. A short story to teach children the value of sharing toys.